As the oldest corporation on Guam, we’re proud to have served generations of individuals and families since 1914. We are convinced that our success as the #1 auto dealer on Guam has a lot to do with our dedication to our customers and the high quality of our vehicle inventory and services. We hope you’ll consider us for all your automotive needs now and in the future. HAFA ADAI from Toyota Rent a Car! 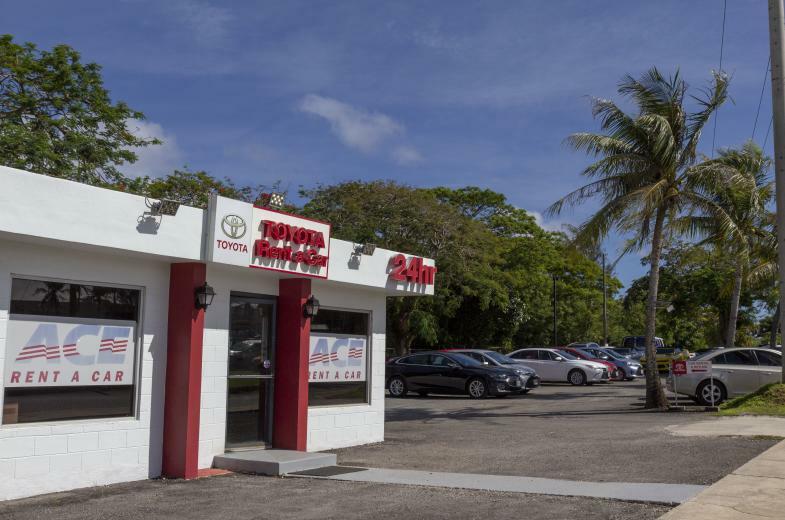 We are happy to help make your experience pleasant, comfortable and convenient with our wide selection of trustworthy vehicles! ACE Rent A Car offers free and fast airport pickup for car, SUV and van rentals at Guam International Airport (GUM). ACE offers the latest models, low-mileage vehicles at substantial savings compared with other major rental car chains. ACE is conveniently located just a short shuttle ride from the airport. Our shuttles run around the clock to get you to and from the airport in minutes. Thank you for choosing us today! If you are arriving by plane and picking up at our airport location, please note that we do not have a desk within the airport. Once you have cleared customs, please proceed outside of the airport departures left side exit. We have shuttle service every 15 minutes beginning at the top of the hour. Our shuttle driver will be there to pick you up. If you are picking up from a hotel location, your agent will notify you of shuttle service time if applicable. If you have any questions or concerns, please feel free to call us at 671-648-8722/24 or email us at trac.airport@akguam.com. Atkins Kroll, Inc. offers the largest selection of vehicles for your commercial or corporate needs. Join Atkins Kroll’s Corporate and Commercial Leasing Program and drive the latest model Toyota, Lexus or Chevrolet today. We offer competitive rates and flexible lease terms structured around your business needs. We offer full routine vehicle maintenance, insurance options, loaner vehicles, complimentary cleanings, company logos, and much more. We also cater to government request for proposals for automotive needs. Call 671-648-8445/7 today and learn more about AK Corporate Leasing.